Immediately the news of the painting hit the public domain there were those in support of the painting and those who opposed it. The painting’s supporters said it was all about the freedom of expression whilst those who were against the painting decided it was a racist piece of art as it depicted the president in such a disrespectful manner. There was a lot of talk of freedoms and rights and arguments as to whether the freedom of expression as guaranteed in the South African constitution was absolute or whether there were limits. From where I sat, I must say the painting made me squirm a little when I thought of the shame and embarrassment that would be visited on the president’s immediate family including his school-going children. But on the other hand, the journalist in me who has been a long-term supporter of Article 19, the London-based human rights organisation with a specific mandate and focus on the defence and promotion of freedom of expression and freedom of information worldwide, I felt that no matter what my personal feelings, nobody had a right to ban the painting. The whole affair reminded me of a few times in my professional life as a journalist that I had been at the business end of censorship. The first time was when I worked for the now defunct Kenya Times Media Trust. The Kenya Times newspaper was owned by the then ruling Kanu party and fairly often, there would be calls to the senior editors purporting to be from State House (occupied then by President Daniel arap Moi) demanding that one story or the other be killed. It was the day of the first ever Saba Saba (July 7) riots in 1990 and I had joined some of my more senior colleagues on the news desk to report on the protests in Nairobi. It was an exciting beat for a young fellow such as I was and a tough day covering the violence of the police on the demonstrators. We got back to the newsroom all pumped up and ready to write up the day’s events but as we sat down to our typewriters, there were already whispers that “State House” would kill the stories. Undeterred, we wrote our stories and developed our photographs and left the office that evening secure in the knowledge that we would carry the news of the day just like the other two independent newspapers of the time, the Nation and the Standard, though perhaps with a pro-government twist. You can imagine my shock and disappointment the next morning when I ran to the news vendor on our street to buy the paper only to find that while the other two newspapers had saturation coverage of the riots, my newspaper didn’t even mention them. It was as though we had been on a different planet. Apparently the call purporting to be from State House had come and my then editor had quickly capitulated, whilst the editors of the other two newspapers had not. Another memorable incident was years later when I was working at another newspaper where the cartoonist had come up with a drawing of the First Lady sitting on the President’s back dictating a press statement to him about family size matters. This time it was not State House that killed the cartoon, but the editors of the newspaper who felt that it would be in poor taste and worse still, it might provoke the wrath of Mama Lucy. The cartoonist decided not to hand in a replacement drawing and the newspaper appeared the next day with a photograph where the cartoon should have been. I ended up keeping a copy of the cartoon and for many years displayed proudly on my wall of photographs in my flat. The point I am making is that though the censors stopped the cartoon from being placed in the newspaper, it was still seen by hundreds of thousands of others who saw it on the artist’s website and so the censorship proved to have been a failure. 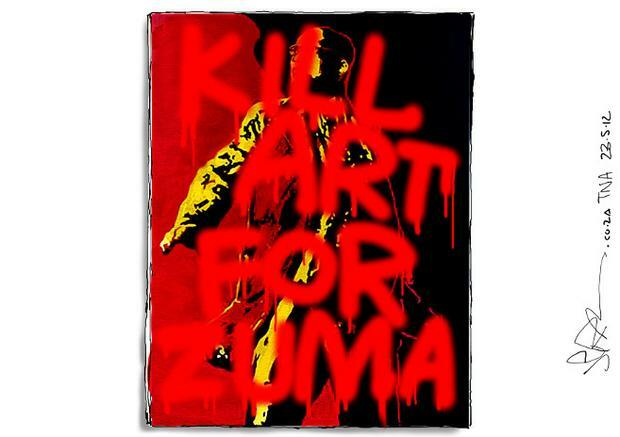 The same goes for the Zuma painting, even before it was defaced by vandals, it had been seen by millions on the internet and continues to be seen by millions more.